We all have different types of lips; some fuller and others thin. Whichever type you have the lip makeup you apply has the power to make them beautiful and standout, well, depending on whether you apply it correctly or not. It is through lip makeup that the entire face definition is brought out after you apply the face makeup. If it’s not applied or applied the wrong way, then you are sure that the whole makeup won’t turn out right. Thus, the need to have it applied correctly cannot be over-emphasized. Below are attractive makeup tips for different lip shades that you can try out. Due to their big dimension and space, you may start by applying lip liner slightly outside the natural lip line and smudge it. This will make them look bigger and fuller. Then, on the upper lip, apply a soft color while the lower one should get a darker color. A clean lip brush should blend everything together. Bottom heavy lips are quite eye-catching though the women who have them tend to shy away from this fact. When applying lip color on them, make the color for both the upper lip and the lower lip the same. Also, put a dab of white on the center of the upper lip. A unique evenness, balance, and fuller look will be achieved and at the end make you look awesome and beautiful. Dark lip colors, when applied on flat lips, make them look small and flat thus the need to apply a soft color. Just like thin lips, start by applying a lip liner slightly outside the natural lip line to give that unique fuller look. The outer corners of the lips should be given a dark color while for the inner part a softer color should be applied. This is one of the ombre lip effects that work best for thin and flat lips. Alternatively, you can apply the same lip color all through then add a shimmery highlighter on the center of both lips to create a gorgeous plumper lip appearance. You won’t believe this magical trick how it turns things around. You can make reviews best lip plumper to determine which one you should opt for. This type of lips is majorly found with Indian women. Line the lips from the center to the outside ensuring to follow the natural lip shape. Then, apply a bright lipstick on the bottom lip and its darker version on the top. This trick creates an illusion of a smaller space making the lips appear like they are small. If you are looking to make full heavy lips appear smaller, a dark toned lip color will work amazingly by making the fuller lips not so prominent. I know the question in your mind is which lips are uneven. Well, these are tips that do not match regarding the lower lip shape and the upper lip shape. I’m sure you have seen one of those. No? Anyway, if you are one of those people who have this very rare and unique lips shape, then to make them stand out, start by outlining the upper lip with a lip pencil. The idea is to make both sides of the lip match. Do the same for the lower lip. For a natural finish, eliminate any rough edges by smudging the lip liner with a very light hand. Care should be done to ensure you don’t draw and unflattering shape. Within no time, your lips will be in perfect shape, looking beautiful. Lip makeup is just like the overall makeup; a skill that requires practice for you to master it at the end of the day. 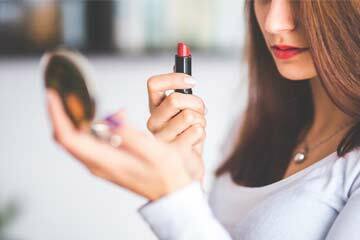 By getting to know what shape your lips are, you will be getting closer to knowing which lip makeup tricks will work out best for you. Also, some basic life hacks such as dark lip colors make lips appear smaller will come in handy. Make a step and look beautiful today.